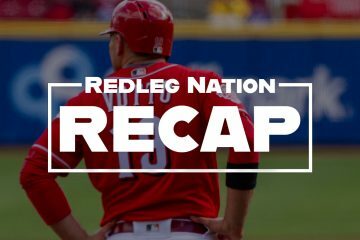 The Cincinnati Reds (10-15) ended their six game losing streak yesterday with a thrilling win in 11 innings in Pittsburgh. Tonight, they’ll kick off a 10-game homestand against the San Francisco Giants (13-13). For the first time in his career, Johnny Cueto will face off against the Reds tonight. Cueto will face the guy the Reds got back in return for him last summer. Tonight’s matchup will be as fun of a matchup as we have seen to this point in 2016. You can make the case that with Raisel Iglesias being put on the DL that Brandon Finnegan is now the Reds ace. While that in itself is pretty scary, Finnegan has done a lot of good things to earn that “title.” Finnegan’s peripheral numbers leave some to be desired, but if you take away the 5 earned runs that he gave up in the 7th inning of two starts (you could argue he should have been taken out before either inning started), his numbers would look pretty good. Finnegan certainly has the stuff to get out MLB hitters. His strikeouts are slightly below league average right now, but he is projected for a much higher total based on his high strikeout numbers at every stop he has made in his short professional career. What is worrisome with Finnegan is the high walk and home run numbers. He will never have success at the MLB level if he walking nearly 5 batters per 9 innings. And when the weather gets warmer, his struggles with giving up the long ball will only increase. Johnny, Johnny, Johnny. Man, I sure do miss Johnny Cueto. While the Reds made the right move trading Cueto last summer, it sure was nice having a guy who every fifth day gave you a great chance to win. Cueto posted a 3.21 ERA in 1,339 innings with the Reds. Cueto’s 2.25 ERA in 2014 is the second best qualifying ERA in a season in Reds history (only trailing Gary Nolan’s 1.99 ERA in 1972). Cueto is the only qualifying Reds pitcher since Jose Rijo in 1993 to post an ERA under 3.00, and Cueto did so twice (2012 & 2014). Cueto struggled last season after being traded to the Royals, and pitching in the AL for the first time. He posted a 4.76 ERA/4.06 FIP in 13 starts. He was especially bad in September, posting a 5.68 ERA in 40.1 innings. Cueto pitched pretty well in the ALDS (3.86 ERA, 13 K, 3 BB in 2 starts), but couldn’t make it out of the third inning in his only start in the ALCS (2.0 IP, 6 H, 8 ER, 4 BB, 2 K). Kansas City was certainly concerned with Cueto going into Game 2 of the World Series, but all was forgiven quickly. He threw a complete game, 2-hit masterpiece to give the Royals a 2-0 series lead. Cueto wouldn’t pitch again in a Royals uniform, but his team won the World Series in five games. Fast-forward to the off-season, and no one knew what to expect for Cueto as a free-agent. Cueto eventually signed a six year, $130 million contract with the Giants in mid-December. He has earned every penny so far for the Giants, posting a 2.65 ERA/2.13 FIP through his first five starts. Pitching in a big ballpark has to be delightful for Cueto, and so far it has been kind to him. He has only allowed 1 HR in 37.1 innings pitched this season. The Reds hitters are in for a treat tonight. In Cueto’s last start, he threw a complete game shutout against the Padres (9.0 IP, 7 H, 0 R, 1 BB, 11 K). Bryan Price’s first two hitters in his lineup have career OBP of .287 and .288.Ã‚Â That should help get a struggling offense going against one of the best pitchers in baseball! The Giants lineup has been pretty good so far this season. Their team 109 wRC+ is the 7th best in the MLB. The heart of their order has been really good: Buster Posey (.284/.344/.457, 4 HR, 117 wRC+), Hunter Pence (.293/.393/.511, 5 HR, 145 wRC+), and Brandon Belt (.289/.413/.482, 3 HR, 140 wRC+). Pence comes in with 3 HR in his last 7 games. Joe Panik (.280/.340/.484, 3 HR, 123 wRC+) normally bats second in the Giants lineup, but he has been out since Friday because of a groin injury. Mac Williamson was just recalled up today from AAA for the Giants. He was hittingÃ‚Â .355/.382/.629 with 4 HR at AAA-Sacramento. He has played in 13 career big league games. The Giants bullpen isn’t good either! The Reds bullpen has been the worst in baseball, and it isn’t even close. The Reds 6.16 ERA and 6.31 FIP are by far the worst in baseball. But the Giants are not great either. Their 4.42 ERA is the 8th worst in baseball, and their 4.01 FIP is the 14th worst. Still, the Giants pen is pretty bad, and they are still about two runs better than the Reds per 9 innings. The Giants bullpen is missing Sergio Romo and George Kontos on the DL. It just gets worse and worse. Raisel Iglesias was placed on the DL yesterday because of a right shoulder impingement. Homer Bailey and Anthony DeSclafani suffered recent setbacks, and neither will be ready to pitch this week as previously hoped for. Cozart had leave yesterday’s game with a knee injury, and he is out of the lineup today. Devin Mesoraco is out of the lineup for a 4th straight game because of stiffness in his left shoulder. It will nice painful to see Johnny Cueto pitch again at GABP. The Reds hitters could very well be in for a long night. But maybe Cueto will have some jitters facing his former team. Or maybe Brandon Finnegan will come out and show that he was a worth being acquired for Cueto. Either way, it is certainly a fun, intriguing matchup in May to see two guys traded for each other square off. Go Reds! If Adam Duvall is the answer, what’s the question? Anybody else going to need a box of tissues and some beer to cry into when Cueto takes the mound for the other team tonight? Um yeah, me either. [sniff, sniff]. It’s upsetting. Going to be hard to face Leake too, especially in a Cardinals uniform. I kind of wish they were both in the AL so we wouldn’t have to face them much. Take Schebler and the bottom half of the line-up all have a better OPS than the top 4. If line-ups mattered I would think Price really needs to move a lot of guys now that Cozart is out. Ok stat boys….hook me up! 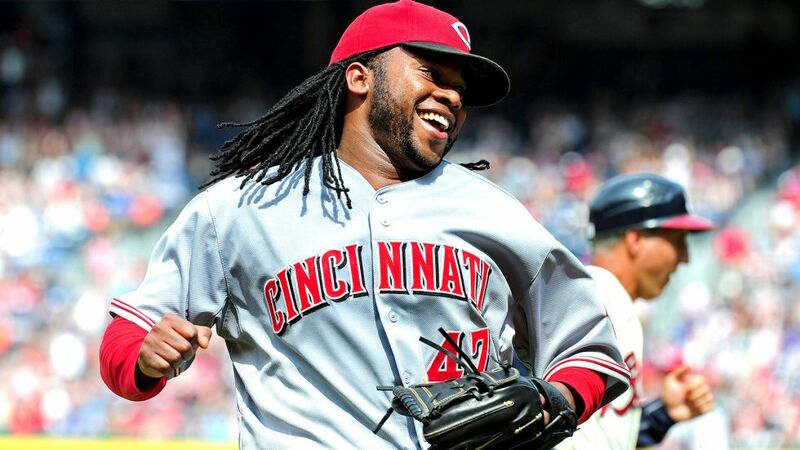 What would Cueto’s 2.25 era in 2014 translate to if he pitched for the Dodgers? Or what would Kershaw’s have been if he was a Red in 2014? Either way a 2.25 era while pitching half your games in GABP is insane!! Has anyone else been under 3 in a full season? Latos was really good and over a run higher if I’m not mistaken? I’m predicting the Giants won’t need more than 1 inning out of their bad bullpen tonight. The Reds front-office is a disaster. Mes is missing his 4th game and with Cozart banged up, they are basically playing 2 men short and one of those guys is a catcher so you have to think Pacheco isn’t particularly available either. The only way Mes shouldn’t be on the DL is if they think he’ll play tomorrow. If they somehow need to use him today though and he does end up having to go to the DL, they can’t make it retro-active. The roster management for my favorite team just seems horrible. All teams carry a guy or two who are day-to-day and out for a while but unless it is a star player, they tend to DL those guys if they are expected to miss more than 3-4 straight games. A star you usually give 7-10 games from what I’ve seen. Agreed and this is nothing new for the Reds. It goes back to the days when Dusty was the manager, and we all tended to blame Dusty. Regardless of how lousy the team actually is, there is not much of an imperative to win with this organization. Johnny C. could very well be in line for a CYA this season, pitching all those games in the west coast stadiums. Good for Johnny! He deserves it and never got the appreciation for his Herculean efforts pitching in GABP. I really wanted to bust Price’s chops for starting Hamilton (OBP .281) and De Jesus (OBP .222) in the #1 and #2 holes respectively, but with Cozart and Mesoraco on the shelf, Votto in the toilet and Pacheco on the roster, the manager can really only do so much. Even if Votto’s in the toilet, he should probably bat 2nd still. He’s had the worst month of his professional career, perhaps, and he’s got an average-ish OBP. That says a lot. Also, give Price’s former penchant for moving guys around to try and get them jump started (or was that Dusty?) I’m surprised Price hasn’t moved Votto from 3rd to try and jump start him. Votto should bat 2nd under any circumstances, but the Reds management just can’t get their arms around the concept of needing players on base in order for someone to drive them in. Tucker Barnhart has a .375 OBP. However, as we all know a catcher cannot bat at the top of the lineup and clog up the bases. 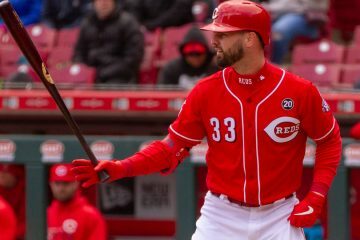 The Bucos needed a leadoff hitter as bad as the Reds, but they actually did something to correct the situation by signing an unconventional leadoff hitter who doesn’t play a middle IF position or CF, doesn’t steal bases and doesn’t just gets on base and had a career .263 BA. He just gets on base. DOH! To top it off, they signed the leadoff hitter they needed to a 2yr/$8MM bargain contract and then moved their best hitter into the #2 hole. Neal Huntington makes WJ look like chopped liver. Looking forward to the Cueto/Finnegan matchup tonight and pulling for Finnegan to match Cueto with blanks through 7 innings tonight. Lovin’ Tucker Barnhart. I think he may even be my favorite Red right now. Comes to play. Terrific defensive catcher and he’s been more than solid with the bat. Feeling better about Gino Suarez’s glove. I think he’s becoming acclimated to the hot corner. Suspect we’re seeing batting numbers recently more in keeping with reality than those of the hot start. Hating our baserunning and defensive lapses. The team…for having a number of veterans, is not fundamentally sound. Encouraged by Billy’s recent hitting…put that fricking ball on the ground and fly…robin..fly !!! Hate our bullpen…nearly every single one of them. Good grief. It must drive Price crazy to have in so many pretenders of major league ability. The base running is the worst for me. It’s so easily fixable, yet the Reds can’t seem to fix it year after year. Mes has just been placed on the DL. Torn labrum worst of all still owed $25 million. Is that not a good thing at least it explains why he was so awful, how long does it take to recover from a torn labrum- not an entire season? Mesoraco had mri. Still trying to figure out best course of action. Bad news: The Reds have placed on the 15-day disabled list C Devin Mesoraco, retroactive to Thursday, with a torn labrum in his left shoulder. Say bye-bye to the power he once had. Poor Devin. We knew him well. What are some earlier position players who’ve dealt with a torn labrum? Did they all lose their power after the injury? Ryan Ludwick ligament and torn labrum. He was older though. One note on that is he had surgery in April and came back in August. I read where he couldn’t strength train until October of that year. Most shoulder surgery has some cleaning of the labrum of debris. I wouldn’t at all be unhappy with a 1-0 Reds win today. Torn labrum? Is that season ending? What caused the injury? I didn’t see the game where he got hurt. I have a suspicion that Mesoraco’s been dealing with it for a while and it just continued to get worse until he simply couldn’t play with it any longer. I wanted to hear what Bryan Price had to say about that, but the Reds’ audio feed from mlb.com is not working right now for the pregame show. This all must have happened after the Price interview was taped. Didn’t mention the DL stuff when asked about Meso. That’s the risk, from an organization perspective, of an early extention with a limited track record. Tucker and Ramon will handle the catching duties now. A backwards silver lining would be the opportunity to DFA Pacheco now and bring up a bat from the Bats. Lamb did not start for Louisville tonight. Sampson did. Probably means Lamb will start Tuesday for the Reds. We have been the most injured team in baseball probably the last 2 years. But part is Bryan Price also. I’m certainly no fan of Bryan Price, mainly because he turned out to be a carbon copy of his predecessor, Dusty Baker. But the team’s issues go far deeper than Bryan Price. The big problems have been a glut of injuries and a front office that has been slow to adjust to new ways of thinking. I don’t care what manager the Reds ran out there in 2015, that team was still losing a ton of games. You guys hear the comments Votto made? He’d rater quit and leave all that money on the table than struggle. I look for him to have an MVP type May. Gee, can’t throw strikes. Which rerun am I watching again? Increasingly, he doesn’t get in front of the ball, just goes down ground-level and swipes at the ball. How did he ever win a gold glove? Thanks Joey….ball is easily within diving range w/Cueto running and he just stabs at it? 3 runs so far and it should have ended with 1? The walks and hbp didn’t help but he’s got to smother that ball and get the out….the ball wasn’t hit like a rocket by any means? Should have ended with 0. That’s if Finnegan was covering first….but yeah! I was saying just smother it and find the ball and get Cueto. Ridiculous because we probably haven’t had more than 3 games all season where he’s produced 2 runs? Let’s walk yet another in front of Posey. They’ll get more but 3 is enough. A rebuilding but bad team that atleast hustles and plays smart I can take but this team walks people like little league and runs the bases like Ray Charles. People go the DL for Skyline Chili heartburn…..don’t think I can make it thru May? Brantley talking about labrum tears (I believe one to his throwing shoulder ultimately ended his career)….. He says a “simple” flat tear that doesn’t involve separation from the bone is an easy fix and reasonably quick recovery (presume that’s what Fay was referencing when he said Meso might be back by season’s end). However, If the tear involves significant separation from the bone, the fix is difficult and the rehab long and “brutal”. So far the extent of Meso’s tear has not been publicly identified (if they have even been able to determine it yet). It will get worse because the Reds chose to play this year with the same leadership in the front office,the same leader in the dugout and the same players on the field.Injuries hurt but it will get better next year but this year will be brutal for Reds fans. I know it’s harsh, but I honestly believe Bryan Price is the worst manager in MLB history. Walt is a good GM, but not for Cincinnati. Don’t you remember Ray Knight? Well that makes up for the defensive blunder. Votto is plus 1 with that Homer. We needed that. I took both Votto & Bruce on draftkings tonight. Cueto getting rocked. I’d be bummed if he were pitching against anybody else. But not tonight. Even stole a base off Cueto. Barnhart looked like he saw a chance to hit one out of the stadium. Amazing that’s the 10th batter of the inning and only the second out. Left 1 on the table. Totally agree. Not only classless but uninformed. The Reds traded him — he didn’t leave the team for greener paychecks. Well, they didn’t have the money to sign him to the deal Johnny wanted. Or were unwilling to commit to the years. Yes, I think they could have signed Johnny to an extension when they gave Homer $100 million bucks. If you recall, Cueto had a lousy 2013 because of the recurring injury to his side. And I think that Bryan Price advised them on that. He looked at Homer’s internal stats. You know, those Sabremetrics that people talk about. Same fans that boo Andy Dalton at Charity Baseball game last ASW. For Shame! Why are Thom and Chris emphasizing weird syllables? Star WARS? Storm TROOPER? CHEWbacca? Is the Star Wars franchise a mystery to them? I wonder how this team compares with others in terms of injured players coming back and getting injured. AND, exactly what does “setback” mean? In the area of injuries, Price has no credibility. Why downplay an injury? The truth comes out eventually. I said trade Mesoraco while we still could. Bailey still might be a good signing. The guy has two no-hitters but gets little love after being rushed to the show! Shouldn’t the law of averages work for the bullpen just once? 20 straight games with the BP giving up at least a run. What a joke. Coming in, Reds bullpen had given up a run in 19 straight games. And now 20 straight games. Rebuild year or not, it’s criminal of the Reds to subject fans to a bullpen this inept. Is Somsen really this bad? His #s have been better than Hayes across the board? They really are going to go down as the worst pen ever….doubt they’ll (or should?) put guys like Lamb or Reed in the pen? They don’t have anyone else? Garrett from AA but he’s prob not ready either? This is ridiculous? More like the tire-yard fire from the Simpsons that’s been burning for 25 years. Honestly, Hayes is a questionable AAA pitcher. Worst bullpen I’ve seen in my 45 years of life. Completely disgusting. Price has no balls. He is just a yes man. Any other manager would have shipped these guys out a long time ago. I long for Kevin Gregg. I don’t honestly have an opinion on Price as a manager but Price doesn’t have the authority to ship anyone off. That’s the GM’s job. He sure as hell has an opinion on who needs to go. You trying to tell me Maddon and Matheny can’t tell a GM who needs to go ? He can say so and so needs to go all he wants but the GM makes the moves. If Price doesn’t like it, he can take it to the press and likely get fired or tell the GM off and get fired or tell the GM he quits. Yes, I’m sure Price has the same level of influence as Maddon…seriously? Agreed. Not a Price fan but with what he’s been given in the bullpen, what can he do? Whether personnel stays or goes is a front office decision. Cue the tinderbox bullpen….lead evaporated…. Pathetic! Reds coming into tonight sit at negative 52 runs, worst in baseball with only Atlanta close! Price did blow the challenge chance here. it was Hayes turn. He’s an older organizational player, and probably wouldn’t be claimed when he goes up and down (well, down) when he gets sent back down to AAA. Shrewd, that Reds front office. Because the fix is in. Just lose baby and we will get those top picks. The fans,won’t put up with it. Cueto comes back and the stands are bare. Never mind. Epic Fail, just like everything else in this organization.